Tomb Raider is undoubtedly one of the most famous video game franchises of all time, originally hitting our PlayStation gaming screens in the late 90’s, it has over the past 20 years developed into one of the most recognisable stories in the gaming industry. The action – adventure video games were created by the British gaming company called Core Design and focused on the adventures of a young female archaeologist Lara Croft. Her journey takes her around the world in search of hidden artefacts, exploring mysterious and often dangerous tombs and ruins. With over 67 million copies of the games sold worldwide, Tomb Raider was and still is a huge hit with audiences of all ages looking for a game that includes solving puzzles, avoiding traps and fighting enemies. It is no wonder that even two decades later, Lara Croft is still a noticeable figure in the gaming industry and Hollywood films are still being produced following her adventures and travels. Tomb Raider continues to attract fans new and old and the adventure theme following the iconic heroine can now be seen in the latest slot game to be released on Microgaming. Even better, this thrilling Tomb Raider slots is mobile and available anywhere and anytime you wish. The growing popularity of mobile gaming should now come as a surprise. After all, the number of mobile devices across the world far exceeds the number of desktop devices or game consoles. Technology has advanced, and with this advancement we have seen a noticeable change in our gaming behaviour. Mobile gaming is much more convenient, allowing players to access their favourite games and play anywhere, whether at home on the sofa, on the bus on the way to work, or waiting in an airport before flying out for your annual vacation. There are almost no restrictions on the time or place that you can play online games these days, just as long as you have a reliable internet connection. Tomb Raider for mobile is no different. The software providers have developed a slot game that is just as quick and reliable on mobile devices as it is on a desktop. The interface is great, and the graphics aren’t too bad either. In fact, the graphics are very similar to the ones used from the console game. The Tomb Raider for mobile can be found on many online websites so that you can access it and play it whilst on the go. Not only does the mobile app provide an ease of access and another level of flexibility for players, but it also brings with it some additional functions such as jackpots, bonus rounds and free spins that are not available on the desktop version. The sites offering Tomb Raider for mobile can be accessed either by your mobile internet browser or by specifically developed apps, and whichever way you choose to play the game, you can be logging on and playing within seconds. Tomb Raider for mobile is no different. The software providers have developed a slot game that is just as quick and reliable on mobile devices as it is on a desktop. The interface is great, and the graphics aren’t too bad either. In fact, the graphics are very similar to the ones used from the console game. The Tomb Raider for mobile can be found on many online websites so that you can access it and play it whilst on the go. Not only does the mobile app provide an ease of access and another level of flexibility for players, but it also brings with it some additional functions such as jackpots, bonus rounds and free spins that are not available on the desktop version. 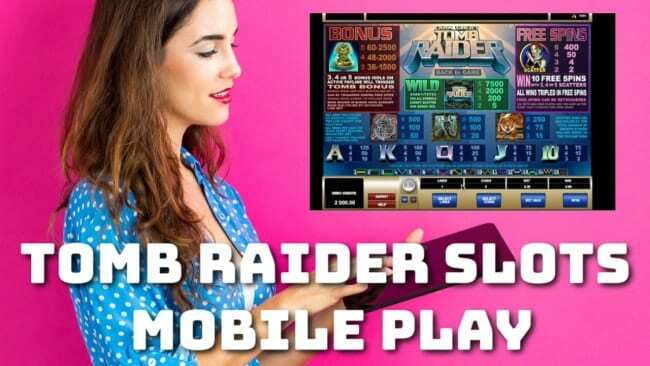 Many of these online websites offer Tomb Raider slots app within their general website app that can be downloaded directly to your smartphone. This means you can be online and playing the game within just a few simple clicks. Microgaming have done the game justice, retaining some of the unique characteristics that attracted a lot of us to the original console game many years ago and providing a theme that remains faithful to the Tomb Raider universe that even the most avid fans will be pleased with. 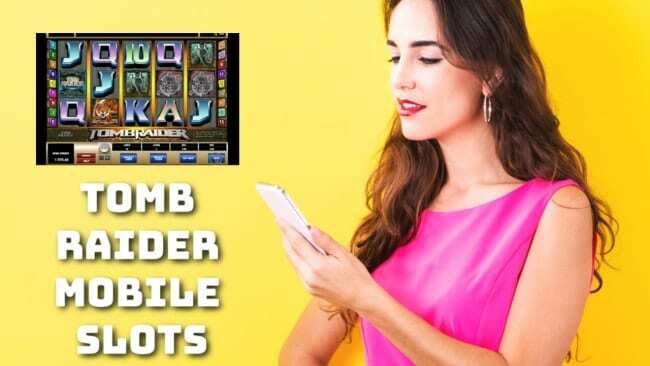 With an exciting interface, old school graphics, smooth gameplay and some impressive wins the Tomb Raider slots app is something that should be played by all, whether an original Tomb Raider fan or not. There is something for everyone here and the simplicity of the game makes it suitable for both novice and experienced slot players. Catch up with the times and experience the joy and freedom that is bought to our lives with mobile online gaming and enter a new world that marks a huge step forward in technology.